Citizen Barnet - trade union news and socialist propaganda from Barnet: Burnout? 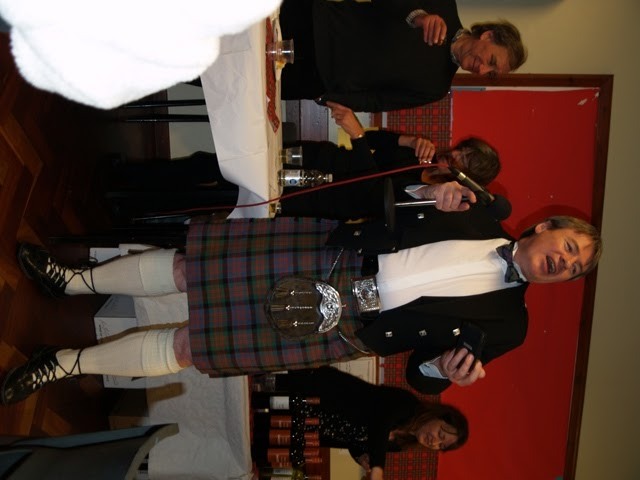 Burns Night! If you follow my blog you will notice a lack of prolificness lately. Sorry, perhaps I was suffering from burnout at the end of last year. I am slowly springing back into life. I seem to be busy enough, but little makes it as far as the 'pages' of the blog. I can report, however, that on Saturday night some friends and I made it as far as the Finchley and Golders Green Labour Party Burns Night quiz. We had a good time, though quiz-wise achieved only mid-table mediocrity. (4) a few photographs, most of which will remain confidential, on the grounds of kindness to my friends (and myself). 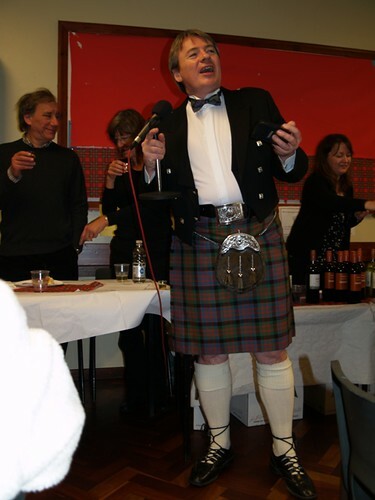 I feel no such personal obligations to Councillor Ross Houston, who looked magnificent in his kilt and, fittingly, to whom it fell to recite Robert Burns' 'Address to a Haggis' (do violence to the Scots language?!). Thank you also to Councillors Kath McGuirk and Alison Moore who did most of the wonderful cooking. I raised a dram in honour of my great grandmother Jeannie Kirkbride (a made-up name?) who made her way from somewhere north of the border south to Wallasey around the start of the 20th century, there to marry my great grandfather John Dean. Were it not for their union... no Citizen Barnet.